Flow measurement is a critical part of oil and gas operations, from quality control to fiscal metering. Here Eugene McCarthy looks at the latest metering technologies on offer. Emerson Process Management has been awarded a five-year framework agreement by Statoil to provide a range of its Daniel fiscal metering systems, as well as related products and support services. The agreement also covers on-going maintenance of existing systems, plus the supply of new systems for all current and future developments. "Since opening our Larbert facility in Scotland in 1974, we have supplied a significant number of systems for major North Sea projects such as Troll (Fig.1), Heidrun and Draupner," said Mark Dutton, vice president and general manager for Emerson Process Management’s Daniel measurement and control in Europe. "This framework agreement recognises the excellent relationship we have with Statoil, and offers Emerson an exciting opportunity to provide Statoil with fiscal measurement systems and solutions for many years to come." In one of the first projects covered by the framework agreement, Emerson will provide a range of integrated fiscal metering systems for Statoil’s new Valemon gas and condensate platform. Located in the North Sea at the Norwegian continental shelf, the Valemon development will include ultrasonic metering systems with fully automated controls for the condensate, gas, and high-pressure and low-pressure flare gas. 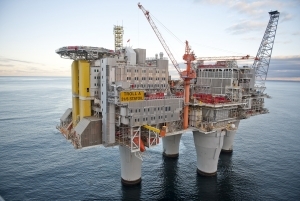 The unmanned platform, which is controlled from the neighbouring Kvitebjørn platform, will begin production in 2014. To enhance its support for North Sea customers, Emerson is currently renovating its Daniel facility in Stirling, Scotland. Enhancements include a new state-of-the-art training facility, a design development and control panel facility, a service area and a UKAS calibration laboratory for its fiscal metering products. Emerson will also be investing in local resources, which includes hiring local service engineers to improve the range of its Daniel fiscal measurement services available to the Norwegian market. Custody transfer is becoming ever more important as it represents a scrutinised cash register between the gas supplier and the consumer. Fiscal flow measurement is a critical part of custody transfer and any small deviation in measurement accuracy of the meter can have a major impact on profitability. Interfacing and configuring the flow meters with the flow computer requires a thorough knowledge of the metering process. Rising to this challenge, Orbital has installed and configured over 150 flow computers in the UK alone. In most custody transfer installations the company supplies a complete turnkey package which would include upstream and downstream spools, pressure and temperature measurement, fiscal meters, the flow computer, the gas quality analyser and a sampling system. Orbital has installed numerous complete metering packages at various locations around the UK. The majority of systems installed have been supplied as complete skids with inlet stream isolation and headers, meter tubes complete with secondary instrumentation, pay and check configuration, start-up stream with switch over technology for power stations but where required, it has also supplied standalone meters with the upstream and downstream pipe being supplied by the client. In the past few years the company installed systems and skids for, amongst others, National Grid, Wales and West, Centrica, Centrax, Uskmouth and Dragon LNG. At Dragon LNG Milford Haven Orbital worked in conjunction with AMEC to design, manufacture, install and commission two six inch and eight inch USM metering skids. The company also works in partnership with SICK for the supply of ultrasonic meters. The company is currently working on a major project in conjunction with GL Industrial Services to replace existing orifice plate gas metering systems. The project involves the supply, installation and commissioning of orifice plates, pressure transmitters, flow computers and other associated components at 23 National Grid sites across the UK. For its part, the IMS Group is a supplier of bespoke metering systems tailored to the precise requirements of its customers. The company’s skid-mounted solutions incorporate all major primary flow elements including ultrasonic, turbine, orifice, and positive displacement meters to meet client’s preference, but also ensuring the most economical solution. As an independent systems integrator the IMS Group is able to provide the optimal solution, selecting from all available products. Pre-fabricated skid-mounted solutions allow better quality control and minimise site installation costs. With multiple systems installed around the world, the company says its metering systems are synonymous with high quality and innovation. When dealing with liquid and gas hydrocarbon extraction it is important to assess the composition of the extracted hydrocarbons. Traditional methods separate liquids and gas phases prior to analysis and metering, but these solutions can be cumbersome and economically unviable. The IMS Group provides complete multi-phase metering solutions that can register individual flow rates of oil, gas and water coming from a wellhead. A multiphase meter provides accurate readings and provides the advantage of continuous well monitoring. Additionally, multiphase meters weigh less and require less space than traditional technology solutions and therefore are more economically advantageous. Meanwhile Ledebuhr Industries says that its AccuStaltic multi-channel peristaltic pumps are ideal for metering. These pumps are truly positive displacement pumps and are very easy to use for precise metering of liquids, says the company. Controlling the rotation controls the flow. Measuring the rotation determines the exact amount of fluid delivered. AccuStaltic multi-channel pumps can pump liquids at adjustable flow rates and are very precise when averaged over time. They deliver a constant flow regardless of variations in back pressure. This feature, combined with the multi-channel design, makes them ideal for delivering the exact same amount of fluid to several points on different length feed hoses. The pumps achieve not only precise metering, but also accurate flow dividing. Established in 2009, the aim of Norwegian company Mirmorax is to become the industry’s leading provider of subsea sampling systems in the oil and gas industry. To this end the company has developed its award-winning Mirmorax subsea process sampling system (SPSS). The SPSS delivers true volumetric sampling on oil, gas and water in the well without interrupting production. The result is the ability to accurately capture fluid properties throughout the lifetime of the field, conduct comprehensive pressure, volume, and temperature (PVT) analysis, calibrate multiphase and wet gas meters to ensure that they operate at their full potential, and deliver increased oil and gas recovery from the reservoir. It is based on a patented technology that ensures true volumetric representation of each phase, independent of the content in the flow. This has a significant value for the operator, not only for multiphase or wet gas representation, but also for analysis of other chemicals or substances in the flow, such as hydrogen sulphide and salinity. The system design is based on standard engineering principles and is a combination of innovation and field proven technologies, such as the pneumatic actuators, pre-qualified OEM ball valves and system for testing pressure integrity. Mirmorax supplies different subsea and topside versions of the multiphase sampling system, from a manually operated system with a single sampling bottle to automated systems with a multi-bottle system integrated into a ROV-retrievable module, skid or container. The sampling system extracts and transports the sample into sampling bottles under isobaric conditions. The sampling bottle will directly give users a water liquid rate as well as a gas void fraction without having to bring the bottle for analysis, as valuable on-site feedback. The sampling bottle may then be transported to the PVT lab for detailed compositional analysis. For high accuracy of PVT analysis, a volumetric representative sample is important for getting correct density of oil and water, as well as for the component analysis. The result is a seamless process from sample collection to final analysis topside – from extracting a representative sample and then storing and transporting to the laboratory facility. And all this takes place while maintaining the sample at its original pressure condition all the way through to the lab. Text: FMC Technologies has signed an agreement with Statoil for the manufacture and supply of subsea production equipment to support the Fram H-Nord development. The contract has a value of approximately US$70m (€56m) to FMC. FMC's scope of supply includes one subsea production tree, one manifold and one multiphase meter. The company will also supply an integrated template structure, one umbilical, two wellheads and additional controls and equipment. The Fram H-Nord field is located in the Norwegian sector of the North Sea in water depths of approximately 360 metres. The equipment will be based on the standard fast-track subsea solution designed by FMC for Statoil. Deliveries are expected to occur throughout 2013. "Fram H-Nord is the sixth fast-track project that we have been awarded from Statoil in the past two years," said Tore Halvorsen, FMC's senior vice president, subsea technologies. "We are pleased that Statoil continues to rely upon our experience and systems to support these projects and to increase oil recovery." EMAS AMC has also won a contract from Statoil to deliver subsea, umbilical, risers and flowlines for marine installation and pipe lay at Fram H-Nord. Worth US$55m (€44m), this is the third phase of the development of the Fram Field which is tied back to the Troll C Platform. Fram H-Nord will be developed with one satellite well tied back to the existing infrastructure at Fram Vest A2 template via twin flowlines and a control and service umbilical.